Bring the party with you wherever you go! 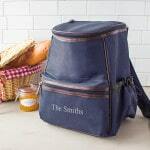 We’ll embroider a single initial or a name on the front for no extra cost. 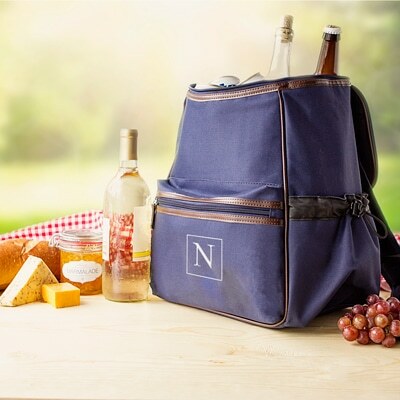 The Personalized On-The-Go Insulated Backpack Cooler is perfect for packing a little something extra no matter where you’re going. 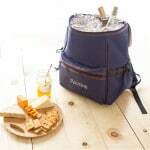 It’s great for camping trips, summer softball games, pre-wedding outings or, better yet, class. 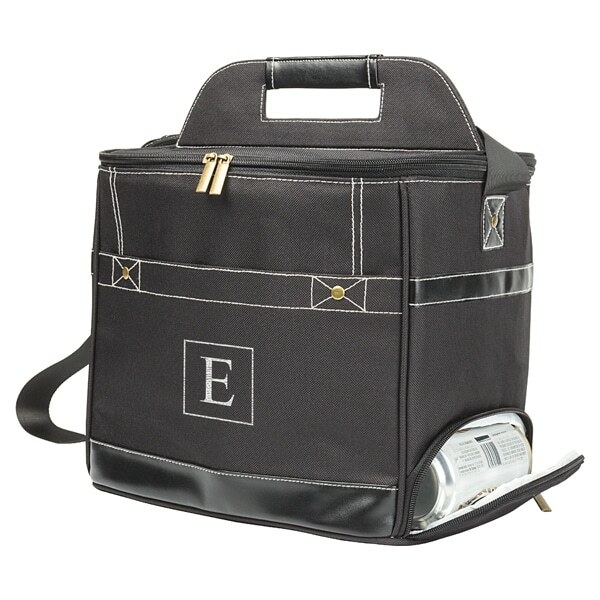 The inside is thermal lined to ensure you get the same cooling effect as you would with a traditional cooler. 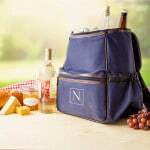 The backpack cooler will comfortably fit a case of beer with ice. 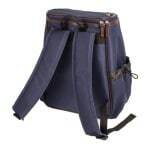 There is also ample pocket space with a sizeable front zippered pocket, a top zippered pocket, two side pockets with elastic fastening to secure keys and wallets, a mesh pocket on the top flap and two padded shoulder straps for comfortably carrying. And don’t forget to add personalization. We’ll add a custom line of text or an initial in a square box for no extra cost. Holds up to 24 cans & ice. Backpack - 11” L. x 6.5” W. x 14” H.
Front Zippered Pocket - 6.75” L. x 11” W.
Top Pocket - 6.5” L. x 9” W.
Side Pockets - 8.5” L. x 7.25” W. Each will hold 2 cans or bottles. Padded Straps measures 15” L with a 14" extender. Sturdy 600D polyester construction with faux leather trim. What's the best way to clean the backpack cooler? The inside can be wiped clean with a damp cloth and dish soap. The outside should be spot cleaned with a damp sponge and hand wash level dish detergent. Blot any stains and then air dry. This backpack is exactly what I was looking for. It holds 4 bottles of wine with some extra room. It is well made and does keep cool for serveral hours.